Authenticity is a strange old thing. You can’t create it, obviously. Although many try. Yet it’s a term often thrown at food and drink places – lauded for having it, or derided for lacking it. 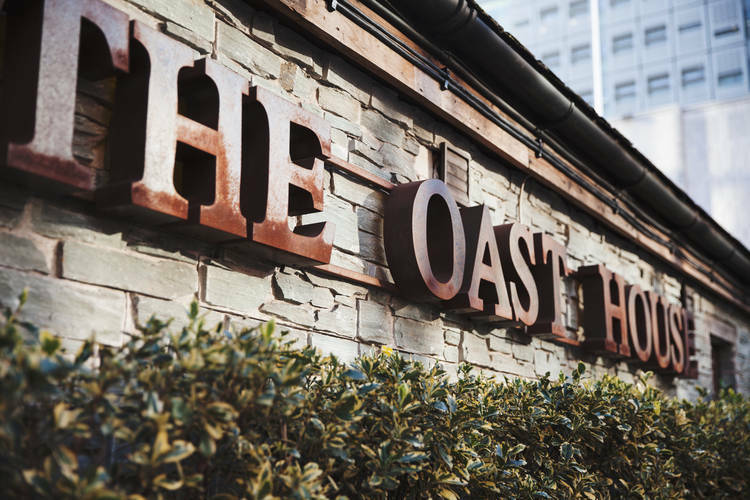 The Oast House in Spinningfields was originally Living Ventures’ take on the hop kiln, but since then as slowly established itself as a decent version of a ‘proper’ pub within the corporate confines of Spinningfields. It’s a beery antidote to cocktails that require an A-level science kit to make, and the outdoor space is an absolute corker in the sunnier months. As with every LIV concept, there is a gimmick lurking in there somewhere, although this time it’s on the food menu – the dangling delights of the hanging kebab, either chicken or lamb, for just short of a tenner. They’re popular, if a little unwieldy, and there is no cool way of eating one. But it’s a talking point, even if it obscures the view of your dining partner at times. This may be a good thing if you’re on a first date that’s not going too well, however. A much better bet is to investigate some of the more solid British classics on the menu. The steak and ale pie (£10.95) was a well-stuffed pastry package that added [plenty of warmth on a damp and dark winter’s evening. Their ever popular hanging kebabs (from £9.95) sopped with sweet chilli and ginger, delivered with a staple ritual, is truly tasty. The halloumi version is good too. But the real star was the half chicken (£9.95), which was juicy, tender, and capable of making Colonel Sanders very, very ashamed of himself. Nicely charred and smoky, and probably the best chicken I’d had in a long time. Including that place with the peri-peri sauce that footballers and rappers seem to so seduced by. A broad and largely pleasing selection of ales await you behind the bar, but you can also get bottles of the most delicious Peroni Gran Reserva or Blue Moon if you fancy going by the bottle, and further afield than the barley fields of our fair isle. The Oast House manages to deliver a cosy, intimate atmosphere despite being plonked near big shiny office blocks and the local crown court, and a world away from the rather incongruous neighbours. By the end of it, you feel like it’s they who are encroaching on your space, rather than the other way around, which is a decent achievement when you consider that The Oast House has been there for a far shorter time than pretty much everything else around it. Not because it looks old, but because it feels like it’s always been there. Homely and reassuring. The Oast House might not be authentic – but it’s certainly genuine enough. And that’s half the battle won.